The CSS for the header comes in two parts and is slightly more complicated. It is possible to implement this as either a fixed, sticky header, or one that stays at the top of the page as you scroll. For the purposes of this post, I've implemented it as fixed. I've also eliminated non-interesting css like text colors so that the important parts stand out. A link to the full project is at the bottom of this post. The first part of the css is for the menu at desktop resolutions. If I had a graphic logo instead of text, I prefer using an <img> tag instead of a background image. This makes it easier for people to right-click and download it if they want to use it somewhere. Additionally, it's easy to support retina resolutions by scaling the image (since background-size isn't supported in still-used versions of IE). 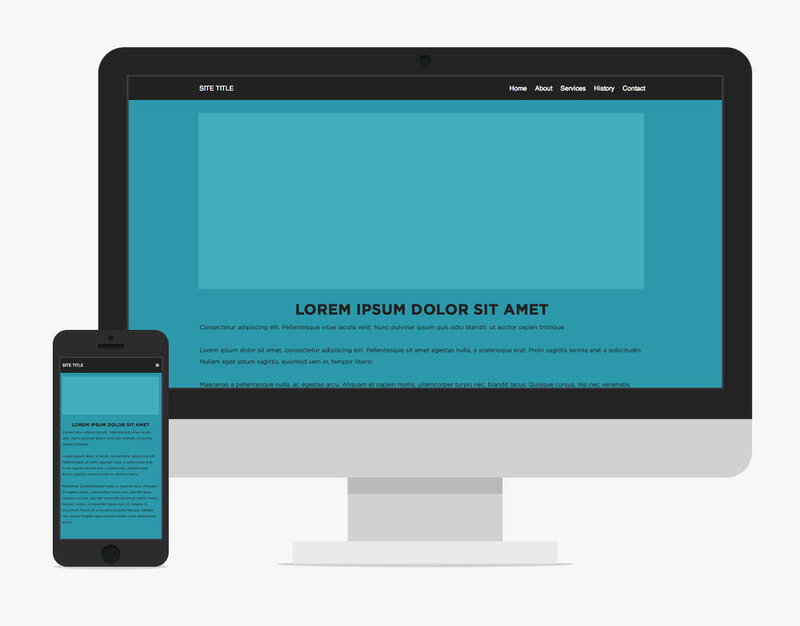 I then set up a media query to handle the header and navigation at mobile resolutions. When setting up your mobile navigation, it's important to be thoughtful about which devices you include. I don't believe in serving mobile navigation (or mobile sites) to iPad users. Since the release of the device, users have expected the ability to navigate "full" websites. Directly clicking menu items is preferable to opening a menu and then clicking an item when space allows it. The next important cutoff are 7" Android tablets which generally fall at 600px. I try to serve these desktop sites whenever possible as well. It hangs the navigation below the header bar, exactly. It uses a css pseudo-element for the menu button. This is pushed back up on the header bar. The menu is then 'hidden'. When the "#nav" block gets the "open" class, it is shown. A nice feature of having the click event on the entire #nav block instead of just the button is that when you click a link, the nav will close while the next page loads, making it seem more fluid. This simple structure can serve as a basis for a variety of designs. You can check out this project here on CodePen or if you've got any questions or comments leave them below! Thanks for sharing. I really like your solution with the menu button for the small dimensions, simple yet lovely. Hi, it is a neat solution, the only problem I have is, if I have a long menu, which is bigger than the viewport, i cant scroll the menu, even if i set height 100% and the overflow y:auto overflow x: none. You have to stop event propagation to prevent bubbling in the DOM, like so..